"Indians' Ancient Bible Signed Again by Queen"
Dunn, Nigel, The Globe and Mail (Toronto) ( CTVglobemedia), 2 Jul 1959 "The Six Nations Indians' treasured Queen Anne Bible became even more valued as a historical possession here today when it was signed by a later Queen - Elizabeth II." "Two Stained Glass Windows Unveiled"
Brantford Expositor, 1959 "Two stained glass windows, the first of eight depicting the history of the Six Nations Indians as related to the Church of England, were dedicated at Her Majesty's Chapel of the Mohawks yesterday." 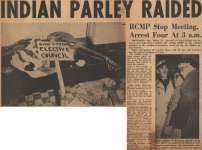 Hamilton Spectator, 13 Mar 1959, pp.1-2 "Four Indians were arrested early today after a scuffle with raiding RCMP in the council chamber of the rebellious hereditary chiefs on the Six Nations Indian Reserve." "RCMP Tense Amid Indians' Uneasy Calm"
"An Iroquois War on White Man's Law"